Inspired by St. John Baptist de La Salle, La Salle Catholic College Preparatory develops students of faith, service, and scholarship by providing a transformative education allowing students to realize their maximum potential and use their gifts to serve Christ and humankind. La Salle optimizes financial and academic accessibility for students, especially the underserved, who desire a rigorous and relevant education preparing them for college and life. The La Salle Prep community inspires students to find their voice as global citizens, to put their faith into action, and to lead exceptional lives of integrity, honoring the God-given dignity of all. 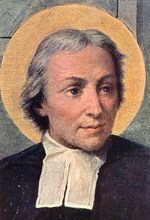 John Baptist de La Salle (1651-1719) was born in Reims, France, to a wealthy family. After becoming a priest he was brought face-to-face with the unmet need for the education of children from poor and marginalized families. Trusting he was doing God's will, he gradually assumed the leadership of a group of lay teachers who devoted themselves to providing free education to the poor. The community called itself the Brothers of the Christian Schools. Despite opposition from the for-profit educational establishment and resistance from some church authorities, De La Salle and his Brothers persisted in responding to the needs of the poor with practical innovations — teaching the students in everyday French rather than in traditional Latin, engaging the whole classroom in each lesson, providing secure and focused learning environments, integrating religious instruction with secular subjects, and — perhaps most importantly — developing the vocation of the teacher as a "Brother" to students, religiously devoted to their welfare and relating to them with love. Other innovations included teacher-training colleges, weekend schools for workers, and a home for wards of the court. John Baptist de La Salle devoted 40 years to the establishment of this unprecedented educational enterprise. He died in Rouen in April 1719. He was canonized in 1900 and named Patron Saint of Teachers in 1950. Since 1966, La Salle has been providing a quality, Catholic, college-preparatory education to students of the Portland/Vancouver metropolitan area. La Salle serves a socio-economically diverse student population; about 19% of this population is minority and more than 60% are Catholic. Our student body is drawn from as far north as Ridgefield, WA and as far south as Salem, OR. Sixteen percent of our students live in the state of Washington. La Salle is sponsored by the Brothers of the Christian Schools and is one of 1,600 Lasallian educational institutions located in over 80 countries worldwide. The Christian Brothers were founded in 1682 by St. John Baptist de La Salle, an aristocrat in Rheims, France. De La Salle was also a Roman Catholic priest and canon lawyer, who used the whole of his inheritance to further the education of poor children, the children of 17th century France's artisan class. Named Patron Saint of Teachers by the Catholic Church in 1953, many characteristics of modern education that we take for granted, such as lessons in common (instruction previously had occurred one-on-one, with tutors), a fixed class schedule, fixed arrival and departure times, education in the vernacular (it had previously occurred only in Latin), first appeared in De La Salle's schools. However, what made De La Salle the pioneer and the educational innovator that he was, was his tenet that teaching is rooted in an authentic love of students and that a truly effective teacher-student relationship must be based on practical affection and mutual respect. This core philosophy remains the foundation of De La Salle's many contributions to education and is a unifying characteristic of Lasallian schools worldwide.